Join Mad To Live Retreats, the ULTIMATE women's surf, fitness and adventure retreat in the stunning Villa Mandala in Taghazout, Morocco! The week is set to be a heart-racing, unforgettable adventure with a focus on physical and mental wellbeing and learning new skills to take home with you. You will immerse yourself in the golden-tinged beauty of Morocco and it’s local surf scene and culture, and leave feeling charged, healthy and invigorated by the experience of a lifetime. The retreat is a jam-packed 7 days of surfing with expert tuition, yoga classes, camel riding, visits to Paradise Valley, local souks and more! The on-site chef will prepare a delicious menu at the luxurious Villa Mandala accommodation with free gifting from all our brilliant partners. You will also have the opportunity to kick back and relax, enjoy the Moroccan culture, beaches and beautiful surroundings. The retreat is based 10 minutes walk from Banana Village and 5km south of Taghazout, a colourful characteristic shining village, famous for its great surf and laid back, friendly atmosphere. 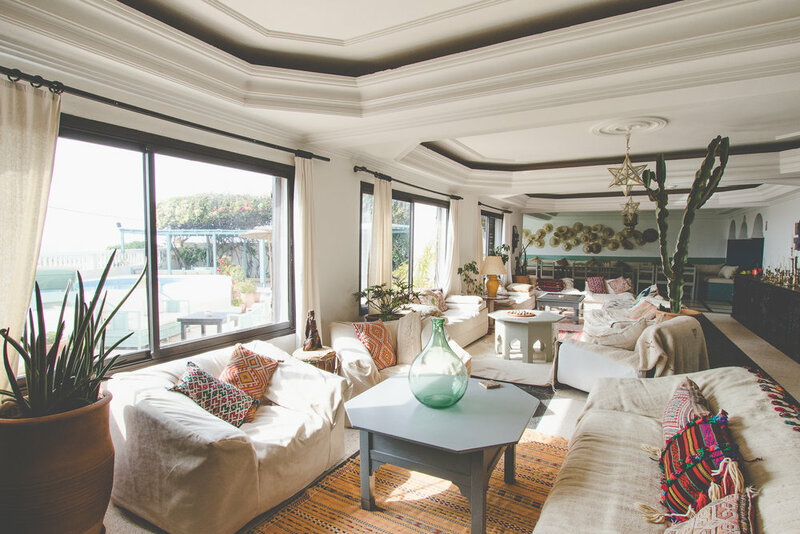 Beautiful accommodation and a roof top yoga shala overlooking the Atlantic Ocean, seconds from excellent surf, a short walk to lovely sandy beaches, near to traditional villages but ideally tucked away from the hustle and bustle of the local market: for a blissful Moroccan ‘retreat’. With free gifting from our awesome partners, expect an epic swag package on arrival! Looking out over the Atlantic Ocean, yoga classes are held in the shade of the wooden roof top yoga shala. With wooden floorboards and surrounding glass sliding doors, the shala is an open airy space blessed with the first rays at sunrise and the last magical light at sunset. An inspiring and unforgettable healing space; perfect for yoga and meditation led by Mad To Live Retreats resident certified yogi Lucy Sweeney. Limited spacing to join this incredible adventure with Mad To Live Retreats is now open! Nutrition focused meals from the on-site chef: All meals included, plus a BBQ night out at Amouage, the boutique hotel! £700 deposit required on booking, with full payment one month after booking. SPRING BREAK SALE ON ALL MAY DATES! £400 DISCOUNT TO £1,00O IF YOU BOOK WITH A FRIEND/FRIENDS! Please aim to arrive at Agadir airport in the afternoon of the arrival date, and departure morning of departure day. You will be greeted by the team at the airport, and taken straight to the accommodation (unless early arrival where we will be having juices at the stunning Café Mouja), ready for the first welcome yoga session of the retreat!